Tequila Cocktails for a Festive Fourth! Phoenix, AZ – April 21 2011 – They never could have anticipated the journey that lay in front of them – an adventure which would include falling in love, traveling to Mexico to reunite with an estranged father of 30 years and sharing a family’s centuries-old passion for tequila with the world. The story began in Arizona in 2005, when former real estate agent Debbie Medina unassumingly knocked on the door of her newest client, Jonathan Gach, a former accountant originally from New York. Their relationship quickly grew into a friendship, and eventually romance. Later that year, Medina, a native of Chicago, was contacted by her father whom she hadn’t seen in 30 years. He was living in Mexico, approaching his 80s, and he wanted to reconnect with his daughter. Gach, who lost his father at the age of 17, encouraged the reunion and accompanied Medina on the trip. The meeting was an emotional, yet uplifting experience. It was on this initial trip that Medina’s father presented them with a bottle of homemade tequila that originated from a recipe passed down by his ancestors in Jalisco, Mexico. Medina and Gach were impressed with the quality and smoothness of the tequila, which traditionally had been shared only between family and close friends. The recipe, process, and passion had been handed down through generations and Medina’s father, affectionately nicknamed by those close to him as “Señor Rio,” shared it with them. It was destiny. When Medina and Gach returned to their homes in Arizona, they knew they must listen to what their hearts were telling them. They left their careers and invested their entire savings with the hope of sharing the family’s tequila with the world. While researching tequila history and culture, the couple began routinely visiting Jalisco in order to find a master distiller worthy of carrying on the family’s legacy. They appropriately chose a distillery in the town of Tequila, where tequila was originally born. They decided to name the premium tequila after the nickname of Medina’s father. The logo is taken from an old picture of Señor Rio when he was in his thirties. The bottle, designed by Gach, is intended to embody the high-standard of elegance that the taste evokes, and it is reminiscent of a crystal decanter used in serving fine spirits. The couple formed their own distribution company, Jalisco International Imports, Inc., located in Gilbert, Arizona. Finally, after years of work and anticipation, the first batch of Señor Rio was bottled and enjoyed on Cinco de Mayo, 2009. Since then, the couple has been working 12 to 15 hour days with ambitions of sharing Señor Rio with the world. They have gone from knocking door-to-door, selling one bottle at a time, to fulfilling shipments that are becoming larger every month. It has not been easy, but the couple has been able to rely on the love and support of each other in order to persevere. “Little did I know that when I rang his doorbell to show his house, this would be our future five years later,” says Medina. Gach adds, “When someone says ‘do you think you’re going to find love knocking at your door,’ you never know, because I did.” Señor Rio Tequila is a testament to their love, as well as to the passion and integrity of the generations from which they inherited its legacy. Señor Rio Tequila originates from 100% blue weber agaves grown in the arid red clay soil of Jalisco, Mexico. It is distilled only twice to preserve the true agave flavor. The hearts of the agaves, or piñas, are harvested by hand and slow cooked in traditional stone ovens. Señor Rio is available in three types: the Blanco, the Reposado, and the Añejo. The Blanco (meaning “white”) is clean and crisp, yet perhaps what is most appealing is the hint of citrus that can be noted in the back of the palette, leaving a smooth finish. This is due to the open tank fermentation process which captures the fragrance from the mango and citrus trees surrounding the distillery. The Reposado (meaning “rested”) comes from aging the Blanco for six months in French white oak barrels from Tennessee. These barrels previously stored whiskey, and this element creates a finish in the tequila that is a nice balance of oak and honey. Finally, the Añejo (meaning “aged”) comes from aging the Blanco for two years in French white oak barrels. This process reveals a marked aroma of the wood and a semi-heated finish along with depth, full-body, and intense flavor. This gentleman’s spirit has been referred to as the “cognac of tequilas,” and is paired well with a fine cigar. 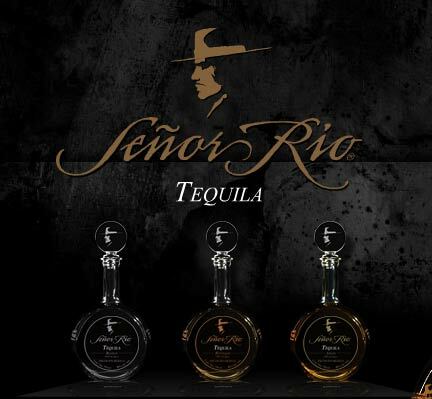 In its brief life on the market, Señor Rio Tequila has already received three awards in taste and presentation from the L.A. Wine and Spirits Competition, the Spirits of Mexico competition, and the San Francisco Wine and Spirits competition. Its superior quality and smooth finish is enjoyed by tequila aficionados and beginners alike. Company: Jalisco International Imports, Inc.